As advised I entered my eval-key (thanks again for this) in the app settings and ticked the box to use the Kopano repository. I was able now to install the fixed release and I can confirm that the issue with “empty mails” via ActiveSync in Outlook is solved. Thanks and great job Kopano-Team! All of this was working before. I already did a complete resetup of Outlook and KOE (including a full resync). As this is less critical I will search now the Kopano and UCS forums for solutions. If you have a tip on what can I check this would be much appreciated. my test inbox is not really large, but you are just referring to the indicator of how far along he is in the sync, right? I could not see any issues with resyncs (i did quite some to get behind these empty items). thanks for giving it a try on your test system. my test inbox is not really large, but you are just referring to the indicator of how far along he is in the sync, right? Correct, this is what I was referring to, the blue bar and the field “Verbleibend” simply do not update during the resync (they remain as shown in the screenshot). I found out that GAB sync is still working for another user on a different computer. But on my local machine with my user it is not. Same with the progress inidicator while resyncing. Very strange … already tried different versions of KOE and even Outlook was reinstalled. Any ideas what else can I try or check? one is the koe logging in %temp% on the client. I am not planning to push this as an update into the official app center. But for you this is not an issue, since you can retrieve it through the subscription key. After update yesterday, I’m affected too. 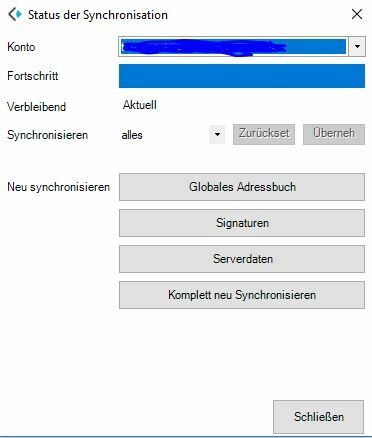 Outlook 2016/Active Sync: (HTML-) Mails not shown at all. IOS Devices show messages but no text in body. I have no subscription key. It seemed there is no other workaround? So, I should rely on webmail only for a couple of weeks/months? If anyone reads this and is too broke to afford the 15€ per user (and year) send a mail to feedback@kopano.io and you’ll receive a 30 day eval key as well. Just want to post that we encountered the same behaviour with Kopano Core 8.6.8.2 since we updated our servers a week ago. We encountered this issue also by using kopano-migration-pst that nearly 50% of the emails showed up empty in Outlook. Even disabling Kopano OLE deleting the account and reinstallung did not solve the issue nearly 50% of the emails stayed empty in Outlook. we’re having the same issue here, using the community edition with z-push and iOS Clients. As far as I understood the thread so far, the bugfix will not be published via the app center?! Will it become part of one of the future updates? Is there a chance to get the bugfix in any other way? Yes, preparing an app update takes time and effort. Not only on our side, but also on the side of Univention. This time I currently have to spend on other things. Yes, naturally. I cannot say when, though. get a Kopano subscription, which starts at 75€ and includes five users and use the repo update functionality of the app. The other benefit of this is that you this way also support further development and allow me and my colleagues to spend time on community work. if you cannot spare the 75€ write an email to the above email and get a free 30 days evaluation key. WOW, many thank for the quick reply, even on Sunday! You guys are really doing a fantastic job here! Emailed with @fbartels today and he indicated an update for Kopano4UCS arriving soon (probalby next week). So I guess this will resolve the problem described here. That’s fantastic news. Thanks for sharing! Mails seem to be okay in the Web interface. Once there has been a 8.7.1 release I will start working on an ucs update. We are still figuring out some stuff for the 8.7.1, though and at this moment I do not dare to make an estimate. I will be away on holiday starting next week, so its either this week or once i am back. Click to download any version, type in your Email address and you’ll receive a serial. Use this in the Kopano UCS App (App Settings) and update Kopano. After the trial period expired you don’t loose any functionality. Your next update then should be the next higher version of Kopano4UCS than the one you have currently installed via repo.